Religious tattoos, such as rosary tattoos, have become increasingly popular in today's culture. Many people are finding that they have an urge to show off their spirituality in their body ink. While there are many different symbols that can be made into religious tattoos, the Rosary is a unique choice. 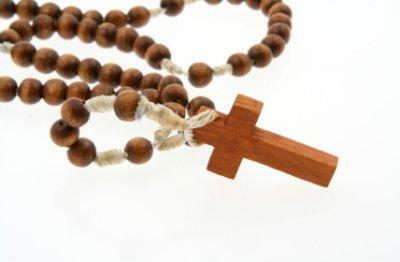 The word "Rosary" comes from the Latin word rosarium - Rose Garden. It is a term for both a set of prayer beads (that often feature a cross at the end) and a form of prayer that is used by practitioners in the Roman Catholic church. To pray the Rosary, a worshiper uses a set of prayers known as a decade. These consist of one recitation of "The Lord's Prayer", ten recitations of "Hail Mary" and one final recitation of "Glory Be to the Father". 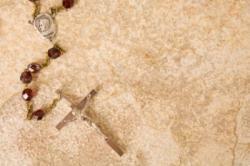 Each bead on the Rosary represents one decade of prayers, and there are 50 beads on the Rosary string. Non-Catholics may recognize these prayers from TV shows that showcase people going to confession, and prayer being their "penance". Most Catholics choose to wear or use a Rosary when praying their decades, and these sets of beads can be made of many different materials, from cheap plastic and resin sets, to those made of glass, wood or even gold beads. Rosary tattoos are usually seen on people who are Roman Catholic, and who want to show off their faith or Christian values. While some religions, specifically Judaism and Islam, denounce tattoos and do not allow their followers to get inked, not all religions have specific rules about tattoos. There are often different sentiments expressed by Catholics and Protestants about the allowance of tattoos in their churches. Both Christians and Jews abide by the Bible, and feel that there is a passage in the Old Testament that specifically prohibits tattoos: "Do not cut your bodies for the dead or put tattoo marks on yourselves. I am the Lord." - Leviticus 19:28 Depending on how strictly you interpret the Bible, this can be seen as a full-on denouncing of tattoos, or just a warning against specific marks from Biblical times. Jews proclaim that this statement means any tattoos on human skin are forbidden, while some Christians do not take the quote as literally.Today, some churchgoers feel ink, such as Rosary tattoos, are not attractive, but others see getting tattoos such as those of the Rosary and crosses to be a welcome sign of faith. Perhaps the most famous Rosary tattoo belongs to Nicole Richie. This Rosary tat is located on Nicole's foot, and forms a circle of beads around her ankle. Many younger women and girls who are thinking about getting their first tattoo are seeking to emulate stylish celebrities such as Nicole Richie, so they want a Rosary too. Richie was considered one of the top 25 hottest tattooed celebrities in 2005, and while she has at least nine other pieces inked on her body, many choose to focus on the Rosary. An eye-catching piece, Nicole displays this prominently by wearing shoes and footwear that accentuate her ink. Other tattoos on her body include ballerina slippers, the word "virgin" (she is a Virgo), a tiara on her hip and a red shooting star that matches tattoos on two of her best friends, the late Aaliyah and Quincy Jones's daughter Kidada. Religious tattoos, including crosses, Rosaries, pentagrams and other symbols, can seem like a great idea when choosing to get a tat. You should be careful, however, if you think you might change your mind about religion in the future. Rosary tattoos can be beautiful and attractive, but if you are unsure about the right religion for your beliefs, a Rosary can be a strong symbol of Catholicism that's difficult to ignore. Remember, it is hard to remove a tattoo once completed, and religious tattoos are definitely among the most controversial and regretted tats.